Here’s the first abstract I’ll review from the EAST 2019 Annual Assembly in January. This one comes to us from the University of Arizona system, and specifically from Tucson. The senior author has an interest in traumatic brain injury (TBI) and geriatric trauma, so it’s not surprising to see this abstract that fuses the two. The aim was to create a new tool to predict mortality in patients who had sustained a TBI. The authors devised a score, the Brain Trauma Outcome Score (BTOS) using three variables: age, injury severity score (ISS), and presence of blood transfusion. Furthermore, this was used to create a Brain Trauma Outcome Score (BTOS), by dividing the BTOS by the GCS. These equations were developed and tested using data sets from two years worth of TQIP data. I know, lots of acronyms, but stay with me. After generating the equations for GTOS and BTOS from one TQIP dataset and testing against another, both of these systems were checked for discriminatory power by generating receiving operator characteristic curves. 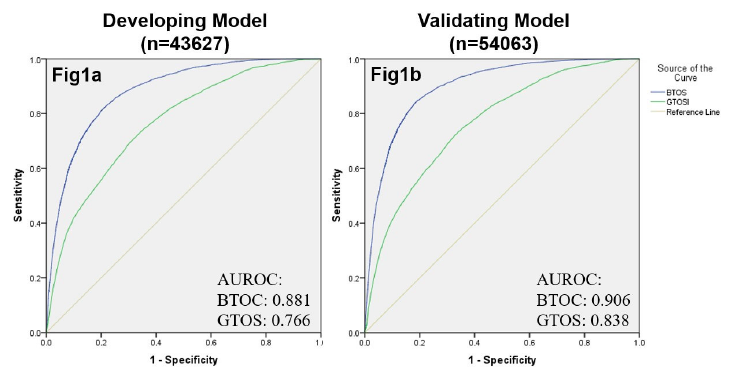 The authors found that the tested BTOS was better at predicting mortality than the tested GTOS. They concluded that “BTOS can accurately predict in-hospital mortality in all TBI patients.” Seems like a pretty bold assertion. Be aware that some typos crept into the final copy. When preparing abstracts, try not to use special characters (i.e. +) as they may not be generic enough for the commercial printing software used to prepare final copy. This is similar to avoiding video or links to YouTube videos in slide sets. I was able to figure out what the question marks really were (I think), but make sure the audience does, too. Why did you even think to create this model? Some new “systems” are just wild guesses, and sometimes it’s even possible to find one that appears to have a significant correlation with reality. What was the rationale that prompted you to combine ISS, age, blood, and GCS? Did your clinical experience suggest this? Papers on related prediction systems? Then what? Is validating your test data using other patients from the same dataset legitimate? Shouldn’t they be very similar since they are in the same 2-years of data? This could make the system less accurate when applied to a very different patient cohort. The GCS range studied was very high and narrow. If I read the abstract correctly, the median was 14-ish with a range from 12-15. These are mostly mild TBIs, so why were they dying anyway? And if the formula for GTOS was derived using predominantly mild TBI data, how can it possibly work well for moderate and severe? And I still worry that patients were dying of problems unrelated to TBI. Make sure you clearly explain your methods to the audience. Some are not well versed in ROC curves, and many will not understand the nuances and potential pitfalls of developing and validating numerical systems like this. It’s easy to lose them, so make sure you are clear and concise in your explanations. How do you see a system like this being used in the future? It’s nice to have some appreciation of the practicality, and an assurance that this isn’t just an academic exercise. I enjoyed the abstract, and look forward to hearing it in person next month! Reference: The Brain Trauma Outcome Score (BTOS): Estimating mortality after a traumatic brain injury. EAST 2019, Paper #6.